Platelet and Plasma Market size was valued at USD 5.8 billion in 2017 and is expected to witness more than 2.5% CAGR from 2018 to 2024. Rising incidence of haemophilia, thrombocytopenia, autoimmune diseases as well as other infectious and rare disease will serve to be a key driver for the platelet and plasma market growth. According to American Academy of Neurology, plasma can be used for treatment of various neurological conditions. Plasma exchange process involves replacing plasma in a person’s blood. This process can be used for treatment of conditions such as inflammatory dysimmune neuropathies, multiple sclerosis, myasthenia gravis and other disorders will accelerate industry growth during the forecast period. Increasing blood transfusion rates in Europe will drive the global platelet and plasma market growth over the forecast period. Blood transfusion process is primarily done to isolate the desired blood components such as red blood cells, plasma, platelets and other vital components of the blood. Government initiatives to create awareness regarding source plasma collection as well as use of lifesaving plasma protein therapies in rare diseases will positively impact the market growth. Advancements in healthcare infrastructure coupled with increasing number of blood transfusions will directly impact growth of platelets and plasma market in coming years. Advent of technologically advanced platelet and plasma products is another major driver that will augment the market growth. Use of platelets and plasma in treatment of rare, debilitating, life-threatening conditions and chronic diseases such as Hepatitis B heavily influences growth of the market. Plasma derived from blood can be used in treating rare diseases wherein no other alternative treatment is available. For instance, use of plasma for treatment of Ebola virus during its outbreak in West Africa. Aforementioned factors will augment the market growth during the forecast period. However, strict regulations regarding plasma collection will impede the growth of platelets and plasma market to a certain extent during the forecast period. Moreover, low affordability in developing economies such as APAC and Latin America owing to high costs will further impact the market growth. Platelet segment accounted for the largest market share with a revenue of USD 3.6 billion in 2017 and will continue to dominate the industry over the forecast period. The reason can be attributed to increasing adoption of advanced technologies for the treatment of various diseases. Platelets are used in various surgical procedures due to its vivid therapeutic and prophylactic applications. According to the World Federation of Hemophilia (WFH), in 2016, around 2,95,866 people suffered from bleeding disorders wherein 1,84,723 accounted for haemophilia. Increasing demand of platelets for treatment of haemophilia and other blood disorders will fuel the segment growth over the forecast period. Moreover, various initiatives by government and other organizations to encourage blood donation among people and adoption of advanced technologies in developed and developing economies will further boost the industry growth. Plasma segment is predicted to witness significant growth rate of 2.1% CAGR over the analysis period. The growth is attributed to rising incidences of chronic diseases such as autoimmune diseases, hereditary angioedema and other rare diseases. Plasma is used for treatment of various rare diseases in case of unavailability of any specific treatment, drugs or vaccines. Moreover, plasma is also used in treatment of neurological disorders such as multiple sclerosis, trauma, burns, shock and other medical emergencies. Growing prevalence of chronic diseases, developments in healthcare infrastructure and supportive government funding in developing economies are projected to augment the market growth over the forecast period. Liver disease segment accounted for more than USD 595 million in 2017 and is projected to witness lucrative growth during the forthcoming years. Prevalence of liver disease such as cirrhosis, hepatocellular carcinoma, hepatitis and other autoimmune diseases is high in many developed as well as developing countries. According to Paris Hepatology Conference, chronic liver diseases (CLD) accounted for 18.5% of all diseases in 2017. Moreover, lifestyle changes, increasing alcohol consumption and growing geriatric population base prone to chronic diseases will further fuel the demand for platelets and plasma during the forthcoming years. Hemorrhage segment is expected to witness significant growth with a CAGR of 2.2% over the analysis timeframe owing to the rising number of hemorrhage cases across the globe. World Health Organization estimated that haemorrhage accounts for more than 7.5 million deaths across the globe. Furthermore, obstetric haemorrhage is one of the leading causes of maternal mortality, accounting for around 35% of maternal deaths annually. Increasing prevalence of hemorrhage, growing disposable income as well as growing demand for plasma and its derivatives for treatment of hemorrhage will augment the market growth over the forecast period. Hospitals segment dominated the platelets and plasma market in 2017 and is estimated to grow at 2.2% CAGR during the coming years. Increasing demand for platelets and plasma for treatment of various diseases such as anaemia, haemophilia and other blood disorders will boost the market growth. Availability of high-cost devices in hospitals, developments in healthcare infrastructure as well as fair reimbursement policies for procedures performed in hospitals will drive the platelets and plasma industry growth throughout the analysis period. Ambulatory Surgical Centres (ASCs) accounted for 28.1% of the revenue share in 2017. The segment is estimated to witness lucrative growth in the coming years owing to growing inclination of people towards ambulatory surgeries. The benefits offered by ASCs such as short hospital stay, reduced risks of hospital acquired infection as well as well equipped facilities will accelerate the growth of platelets and plasma market during the analysis timeframe. North America Platelet and Plasma Market accounted for the highest revenue of over USD 2.1 billion in 2017 and is projected to grow at a significant rate during the forecast period. The growth is attributed to the increasing cases of cancer, obesity, cardiac diseases, neurological disorders and other chronic diseases. Furthermore, American Red Cross undertakes various initiatives for increasing awareness regarding importance of blood donation. Blood donation systems in North America are based on a mixed system of non-compensated as well as compensated donations. Moreover, high demand for advanced technologies coupled with availability of advanced healthcare infrastructure will augment the regional growth during the forecast period. Europe region is expected to witness remarkable growth with a CAGR of 1.9% during the forthcoming years due to high number of blood transfusions in Europe. Plasma and its derivatives are used for manufacturing medicinal products for patients in need. Blood transfusion is in high demand amongst the German population undergoing chemotherapy treatment owing to rising prevalence of cancer. Moreover, growing incidences of road accidents as well as increasing cases of minor muscle injuries due to athletics and other sports will accelerate the market growth in foreseeable future. 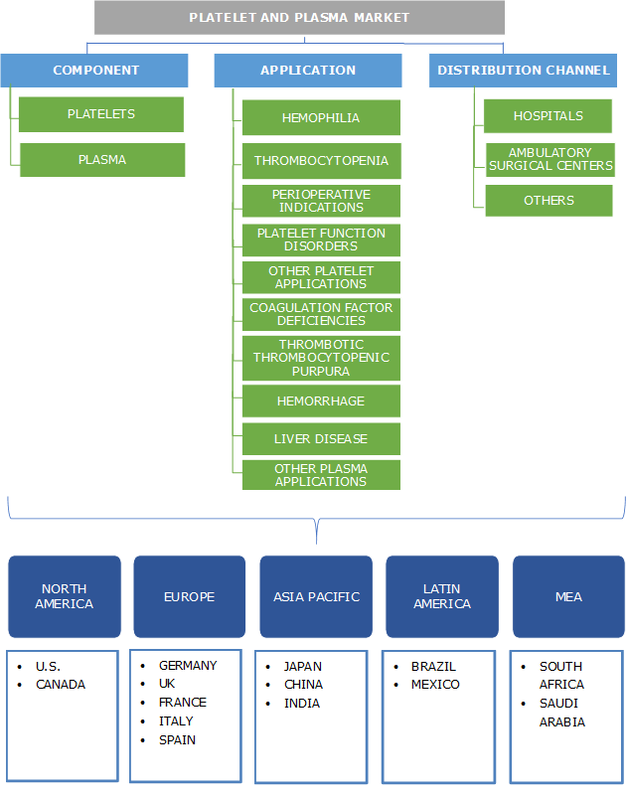 Some of the key industry players operating in global platelet and plasma market are American Association of Blood Banks (AABB), American Red Cross, America's Blood Centres, European Blood Alliance, Indian Red Cross Society, Japanese Red Cross Society, Australian Red Cross, AVIS National, South African National Blood Service and OneBlood. Industry players are primarily focusing on strategic partnerships, mergers and collaborations to increase awareness regarding blood donation and encourage use of blood components in treatment of various diseases. For instance, in February 2015, America’s Blood Centers joined Alliance Across America to enable centers to transport blood over long distances making the blood centres more approachable. Rising prevalence of chronic diseases such as haemophilia, thrombocytopenia, haemorrhage, liver diseases as well as other rare and infectious diseases will drive the global platelet and plasma market. Various government initiatives to increase blood donation leading to higher number of blood transfusions globally will further propel the industry growth over the forecast period. The industry is expected to witness robust growth during the forthcoming years owing to growing demand for technologically advanced therapies for disease treatment. Key market players are rigorously investing in research and development activities to develop various applications of platelets and plasma in treatment of chronic and rare diseases.